Item number Na1551 from the MOA: University of British Columbia. 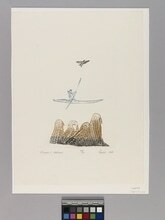 Print depicting a black bird at the top, a blue man in a kayak at the centre, and four black and brown walruses at the bottom. Below the image is written, "Kayak & Walrus 44/50 Pauta 1968." The Canadian Eskimo Arts Council blind embossed stamp is in the bottom right-hand corner.